Notes for the Road: Walk Georgia Blog | Fall is Apple Pickin’ time! Fall is Apple Pickin’ time! Fall is the time of year when apples are perfect for picking. There are several places, mostly in north Georgia, where you can pick your own apples. Go online to find several you-pick locations. Next time you are at your local farmer’s market or grocery store, try an apple you’ve never tasted. Different varieties have interesting and unique flavors. Of the hundreds of varieties of apples, a mere 15 make up 90 percent of the apples produced in the U.S. You may find some of the following types right here in Georgia: Gala, Red Delicious, Empire, Jonathan, Golden Delicious, Rome Beauty, Stayman Winesap, Arkansas Black, Granny Smith, Yates, Fuji, Ginger Gold, Cameo, Mutsu, Honeycrisp, Beni-Shogun, Criterion, Splendor or Pink Lady. Apples can be eaten whole, sliced, baked, canned, dried, chopped in salads and mashed into butter. 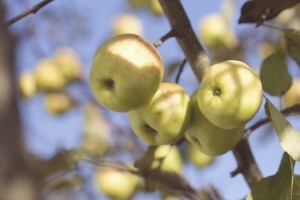 Apples are naturally low in calories, fat and sodium and are a powerful food when it comes to fighting disease. Apples have lots of fiber to help keep your digestive system healthy and happy, and they contain a large variety of phytochemicals – depending on their color – that can reduce oxidative damage and lower the risk of certain cancers. Apples also contain a compound called pectin that helps lower cholesterol. Of course, don’t forget about all the other yummy fruits out there. Several fruits pair well with apples, such as grapes and berries. Some apple varieties are as small as cherries. Apples ripen 6-10 times faster at room temperature than if they are refrigerated. It is best to store apples at 35-40 degrees with relative humidity of 80 to 90 percent. Apples are a member of the rose family. It takes energy from 50 apple leaves to produce one apple. Posted in Featured. This entry was tagged apple, apples, healthy, holiday health, nature, nutrition, pick your own. Bookmark the permalink.